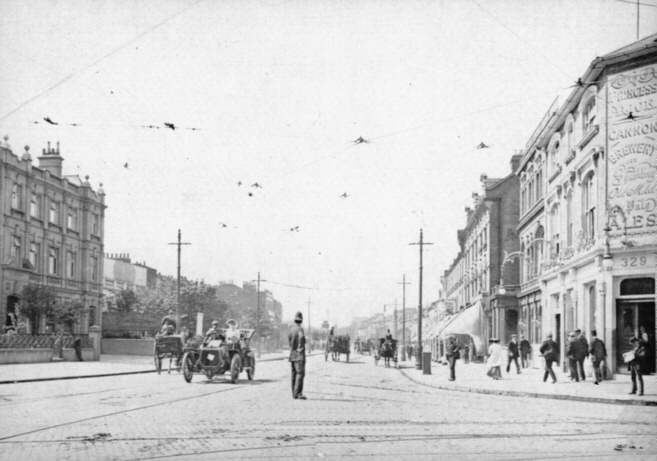 As construction works begins in earnest around Forest Gate station now, and next year on the Goblin line, to facilitate the next stage in the area's transport story, and future development, it seems worth a pause to look at how early road and railway construction helped make Forest Gate what it is today. 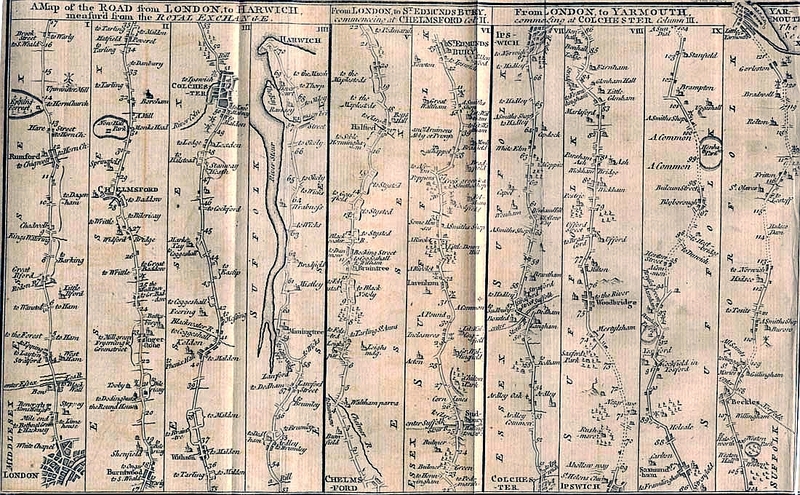 That great road from London thro' this whole county towards Ipswich and Harwich which is most worn with wagons, carts and carriages and with infinite droves of black cattle, hogs and sheep of any road in England. All those villages are increased in buildings in a strange degree ... and the towns of West Ham, Plaistow, Upton etc. (so insignificant was Forest Gate in its own right at this time that it was bundled up in Defoe's etc!) in all which places above a thousand new foundations have been erected ... this increase is of handsome large houses ... being chiefly for the habitation of the richest citizens (see future articles in this blog featuring the development of Upton, and Upton Lane, in particular) ... there are no less than 200 coaches kept. A survey of road traffic entering London from the East in 1830 showed that 494 wagons passed along the road each week, along with a thousand head of cattle, 8,000 sheep, 400 pigs and 150 calves. In addition, private carriages had driven over 350,000 miles along the road and people on horseback rode over 700,000 miles along it during that year. 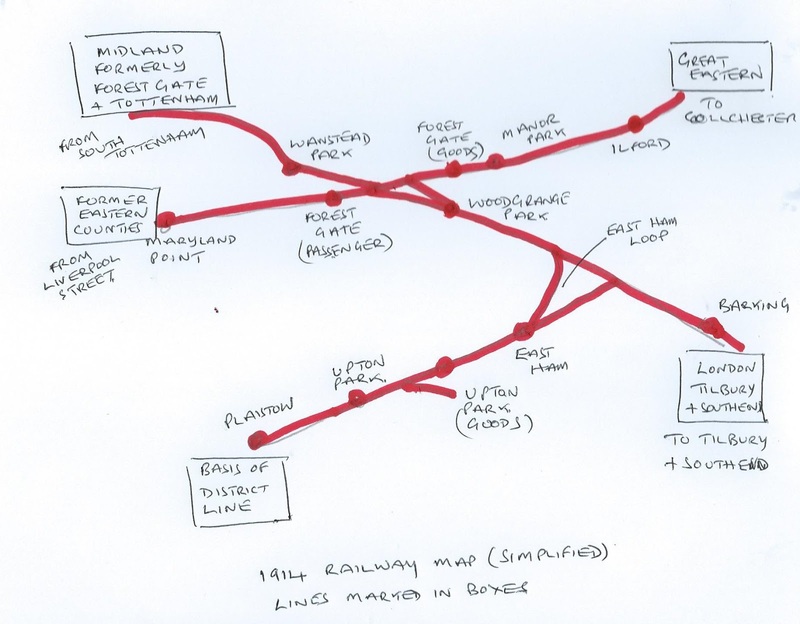 The road was struggling to cope, and ambitious plans for developing a steam locomotive along the route were drawn up. 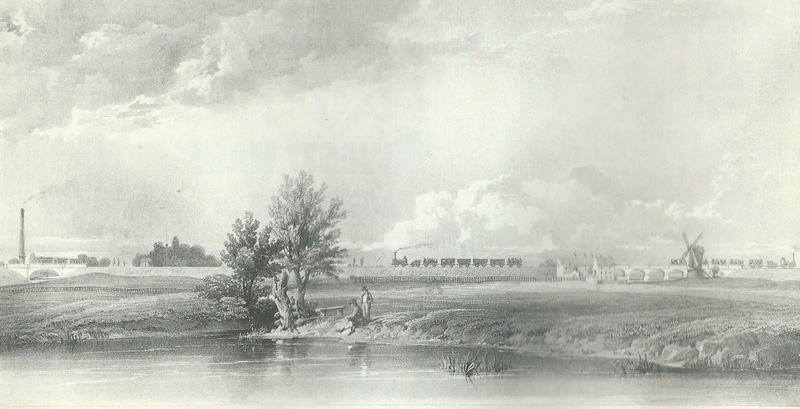 According to plans in the Essex Record Office, an 1803 proposal envisaged horse drawn locomotives being transported over railway lines, to their destination on the Essex coast. In the event, the scheme, which would have seen an early "railway" rattle through Forest Gate, came to nothing. It was over thirty years, 1836, before two railway schemes, each playing a major role in the development of Forest Gate, received the Royal Assent. 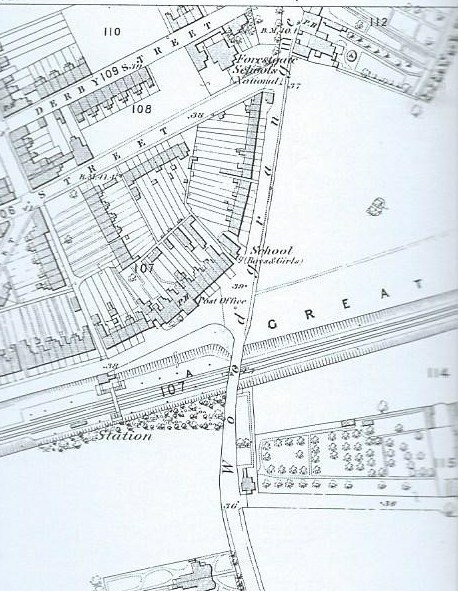 The first came from the Commercial Railway Company, built to improve the haulage of both goods and passengers between Brunswick Wharf, at Blackwall and the City. 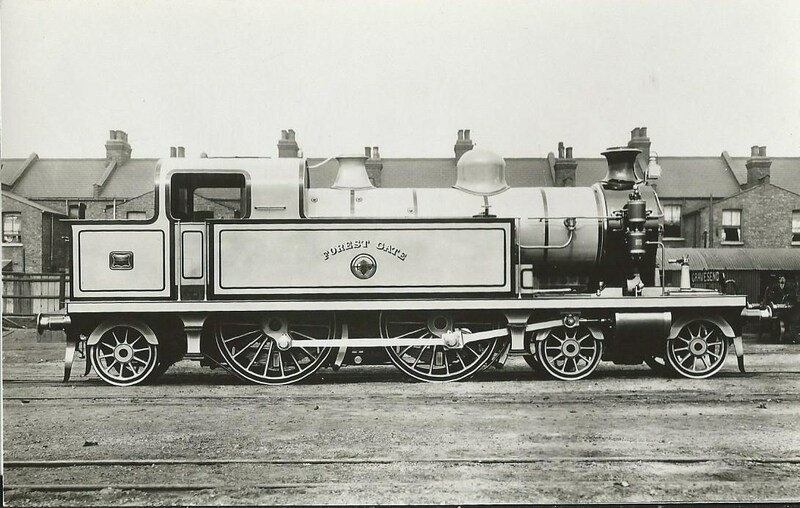 The second was the Eastern Counties Railway, promoted to transport coal from Great Yarmouth (a considerably more important port then, than today) to London. The original proposed route for the Eastern Counties line was to start at Shoreditch High Street and head eastwards, via Bethnal Green to Mile End. 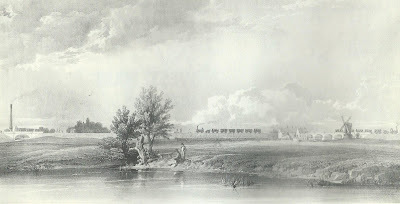 Here the railway was to veer south, to Old Ford and cross the marshes to Stratford (see engraving, below). The preferred route from Strafford through Forest Gate was for a straight line running in parallel, north of the Turnpike. 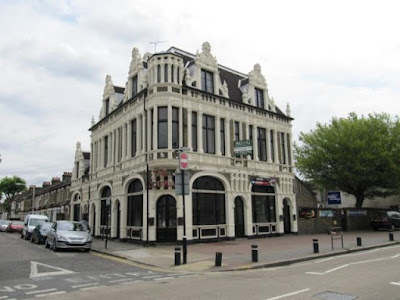 On the plans submitted to Parliament, an alternative route, passing north of Forest Gate's Eagle and Child pub was shown. In the event, this was not adopted, and the original proposal was used for the route. The surveyors recorded the following properties along the route as being in Forest Gate. From West to East: Prospect Place, containing 12 cottages and a small chapel, Chapel Place with six cottages with gardens, Pleasant Place, with 8 cottages with gardens and Whitehall Place, with 8 cottages. All these places were owned by John Pickering Peacock. Then came the Eagle and Child and two cottages, owned by the brewers Combe Dalafield and Company. Next was a series of properties including the houses and gardens of John Brown and William Leverton, buildings and yards owned by Joshua Pedley and the cottage owned by Richard Curtis (no, not that one!) Finally came a place called Hoppett by the Lane, a meadow with a cottage and garden and the Mansion House buildings and yard, all these being owned by John Greenhill. John Braithwaite was appointed engineer of the Eastern Counties Railway and the Railway Magazine was quick to point out his inexperience, and woeful track record, to date. It, with a note of irony, predicted that it would take him until 1836 (i.e. a hundred years) to complete the construction to Great Yarmouth. The first twelve miles of the line were, in fact, opened in June 1839 - from Shoreditch to Romford. Two days later, the line experienced its first accident, when both the driver and his stoker were killed, when the locomotive "leapt off the track". The driver, John Meadows had been dismissed previously by another railway company for "furious driving". the River Lee, on extreme left of picture. The first Forest Gate station was opened in 1841. It originally consisted of a small wooden structure, with an entrance on Forest Lane (see location, on Forest Lane, in the extract from the 1867 OS map, above). It was only, originally, served by two trains a day and so poor were the passenger numbers that it was closed, because of lack of trade, between 1844 and 1846. In 1845 the shareholders of the Eastern Counties railway invited George Hudson ("The Railway King") to help bail them out. Hudson was a crook, but was the inspiration behind building the railway works and sidings in Stratford. In gratitude, part of West Ham was named after him. The railway workers in Stratford needed homes, and soon housing was constructed by building societies in parts of Forest Gate, to accommodate them. The trains were few and uncertain ... Ten or twenty minutes belatement we thought nothing of. Sometimes trains did not come at all ... I do not think there were more than seven or eight trains each way per day. On an average, about six people entered or left at Forest Gate. "Railway Mania" was an appropriate term to describe the chaos created by rival companies, essentially serving the same area and competing furiously, and often unscrupulously for passengers and freight. the roundel was incorporated into the station. 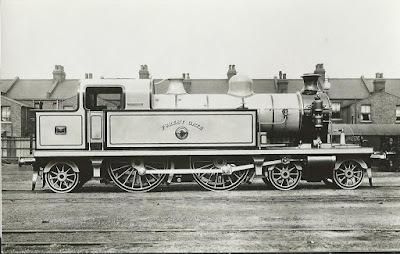 Early "tourism", rail day excursions and publications like Bradshaws were produced to cater for the rapid development of railways not just for business, but for leisure too. 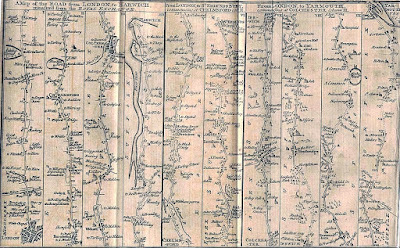 Bradshaws became almost a bible for travellers, providing early versions of what we, today, would call travel guides, offering lengthy descriptions of the key points of interest in and around railway towns and stations. And so yet another railway came to service the area, this time in the 1890's, and actually featured Forest Gate in its title. This was called the Tottenham and Forest Gate Railway (the core of what is now better known as the Gospel Oak to Barking - Goblin, or Chimney Pot - Line). 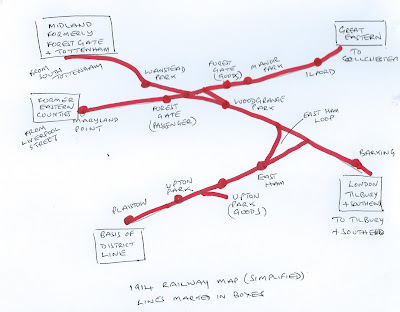 It was to link the Midland railway, at Tottenham, with the London, Tilbury and Southend Railway at their junction with the Great Eastern (formerly Eastern Counties Railway). (Confused? You aren't alone). See map, below, for clearer portrayal. The Tottenham and Forest Gate railway met much popular opposition, as over a hundred recently constructed houses in Forest Gate had to be demolished to make way for the viaducts that carried the railway through the district. The railway opened in 1894 and was soon running, in conjunction with other companies, trains between St Pancras and Tilbury, via the newly opened stations of Woodgrange Park and Wanstead Park. The company soon needed more rolling stock to cater for its expanding numbers of passengers, so in 1897-8 it commissioned the construction of 12 engines to service the line. 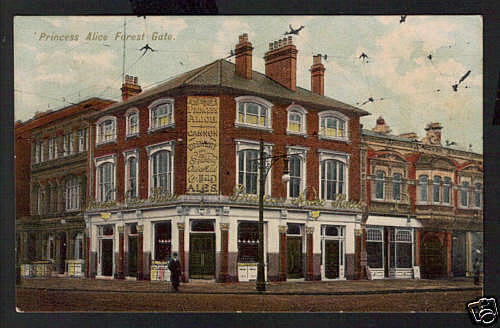 Each was named after an Essex town, or place on its route, one of which was called the Forest Gate - see photo. This, like the other in the series (LTSR 37-48), was in almost continuous commission until it was scrapped, in 1951. 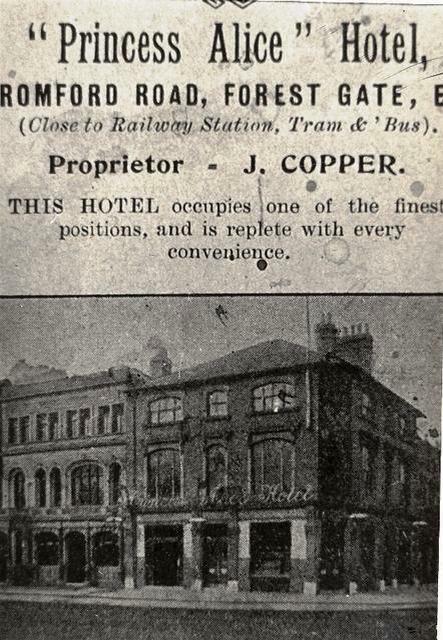 Forest Gate was now well served, and heavily dependent on railways, as a form of transport. The six or eight passengers a day of 1841, rose to over 10,000 immediately prior to World War One. Yet another form of local public transport was being developed to help with the commuting needs of the Forest Gate and area's population from the 1870's: trams. See our earlier post (here) on their history in the district. In our recent feature on what may become Forest Gate's first £2m house (here) we noted that it was "listed", by English Heritage and gave the grounds for its status. There are, in fact ten "listed" buildings in Forest Gate. We feature the other nine in a two-part series, of which this is the first. The borough of Newham boasts 116 such buildings, many associated with the former Docks, Tide Mill in Stratford, Abbey Mills pumping station, churches or cemeteries. Three have Grade 1 listing (All Saints, Strafford, Tide Mill, itself, and St Mary's the Virgin, East Ham). The other 113 are Grade 11 listed. "Listing", in lay terms, means that the conservation body English Heritage recognises that the building has features of architectural interest which are worthy of preservation. These are highlighted in the citation for listing and are included, in each case, in this article. Local authorities have a responsibility to ensure that, as far as possible, these features are preserved and will not, under normal circumstances, give planning permission to attempts to disrupt them. 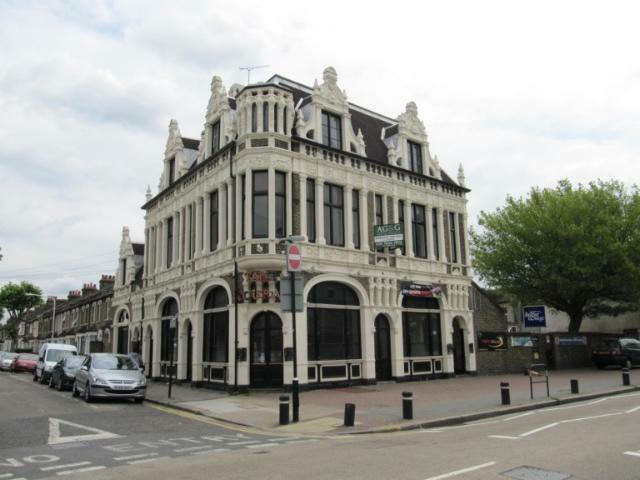 For their owners this can be a double edged sword: kudos of owning a listed building, but often real difficulty in changing its design or appearance which can cause difficulties if looking to sell - presumable an issue for the owners of ex-pubs the Spotted Dog and Earl of Essex - see next episode. The text below is (slightly) edited from the English Heritage website and can, in places, be very architecturally technical. But even a lay reader can get the drift of what is being appreciated by those responsible for the listings, from their citations. House probably circa 1840. Two storeys, four bays wide with asymmetrically placed entrance, all under hipped and slated roof set back from road frontage. Of stock brick, double fronted with additional bay to north. Segmental headed ground floor sashes set in recessed semicircular stucco arched surround tied together at window head level by a profiled stucco string. First floor segmental headed sash windows lie below closed overhanging roof eaves. Main entrance accentuated by entablature supported by Doric columns. Interior not seen. In the 1950's it was run as a wedding venue by a company called Hart and Holman. They had a huge function hall, which embraced, among other things church and Sunday School events, from the Christian Israelite church, almost opposite. One local attendee described events there as being "the highlight of our year". Church and Monastery 1884 (foundation stone) finished in 1891. Architects Pugin & Pugin (Of Houses of Parliament fame). Early English and Geometrical Gothic Church. Yellow stock brick with ashlar dressings. Slated roofs. Austere. 7-bay nave with tall clerestory. Lean-to aisle roofs, double to (liturgical) south, to incorporate confessionals. Gabled chapel to south. South-eastern apsed chapel. Rose window over High Altar. 6 light traceried window to west end above gabled entrance. Cuspless three-light clerestory windows. Lancets to confessionals. Monastery 2-storeyed with transverse gable to left and smaller gables to centre and right. Similar materials to church, but blue, chamfered engineering bricks to window openings. Lower windows paired lancets with leaded lights. Beneath gables three light tracery windows, pointed head to left, the others with stepped, square, heads. Walls buttressed. Building linked to church. Gabled entrance, porch to left, with Mother & Child statue in canopied niche above. 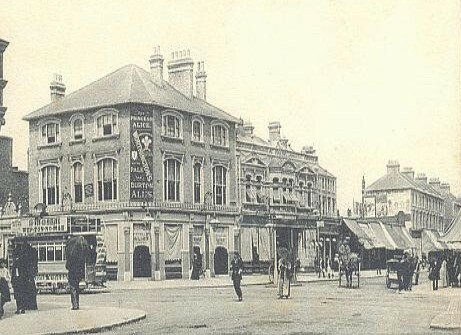 Public house circa 1895. Frederick W Ashton. A richly ornamented corner public house. 2 storeys with slated mansard and attic storey. Yellow stock brick with painted stone or stucco dressings. Jacobean motifs. Balancing elevations to Katherine Road front and to Stafford Road flank with 2-storey wing on flank. Front has two segmental arches to ground floor, two 3-light windows to first floor, and balustraded with buttresses gabled dormers above. Ornamental panels above and below first floor windows with panelled pilasters between. Octagonal corner turret, (dome now missing) with linked female caryatids to drum. Arched entrances between ground floor, windows and to corner, with carytid-ornament above. Chimney stacks have pilaster ornament, and those on south side are gabled and buttressed like attic window. Similar gabled window to slated wing. Later single-storey wing at back. Interior not seen. Church 1852. Sir George Gilbert Scott. Decorated Gothic style. Kentish ragstone. Tiled roof to eaves. No clerestory. Perpendicular north aisle of 1890, the same height and width as original nave. Short tiled broach spire over chancel arch. Lady Chapel to south side balances organ chamber to north. Lean-to south aisle. South porch. Aisles are buttressed. Low turretted north transept. Vigourously foliated columns to 6-bay nave arcading. Former Congregational Church of 1880 by T Lewis Banks with church hall of 1883. 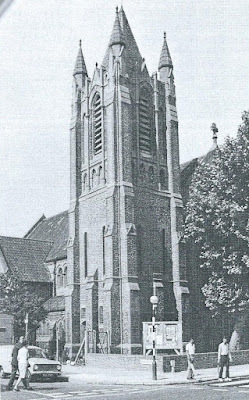 Later known as United Reformed Church. Converted in 2002-3 to a school, the Azhar Academy Girl's School. Materials: Knapped flint with red stone and red brick dressings, tiled roof. Exterior: Early English Gothic style. Externally the former church is largely as constructed, having an nave with lean-to aisles, south-eastern vestry and 3-stage buttressed and pinnacled tower with short spire to the south-west; the former church hall abuts the church's east end. The tower has triple arcading to top stage with a gabled centre panel of louvres and blind arcading below. To Romford Road, the west end has two gabled, porched entrances with arcades between on the ground floor above which are three lancets with brick mullions flanked by trefoil arches and single lancets; the uppermost portion of the gable has triple lancets, flanked by blind single lancets, and a decorative cross set into panel of red stone at the apex, the pinnacle of which is missing. To the right of the entrance is a projecting vestry, which resembles a short tower at the lower levels with arcading to ground floor and buttresses to corners, triple mullioned windows to first floor, and parapet above. It is surmounted by a steeply pitched, curved-hipped, tiled structure, almost semi-circular, with continuous timber mullioned glazing with leaded lights. Twin gabled transepts project to either side of the nave with round-arched, stepped lancet windows, moulded brick mullions and stone pilasters. The two-storey, gabled former church hall to the rear of the building has gabled porches facing west. The lancet windows to the west and north have all been infilled with breezeblocks. The single bay joining the former church to the hall has been converted into a stair and heightened with glazed clerestory and a modern roof. A two-storey former clergy house with gables to north and south abuts the rear of the hall to the east. It is of flint with brick quoins, chimney stacks and window dressings, and the gable to the north is rendered. The window to ground floor has been blocked which is adjacent to a small brick porch with pitched roof. Interior: None of the original fixtures and fittings remain. Classrooms and offices have been inserted into the former nave, arranged across two mezzanines, fronted with glass to the central hall areas. The upper floors are reached by a stair and lift in the tower and the stair at the rear between the school and old hall. The nave arcading - large sandstone pillars - and aisle and clerestory window mouldings remain exposed and the contrast between modern and historic materials means the old arrangement is roughly readable, assisted by the use of glass partitions. The windows have red brick and red stone arched dressings with red stone pilasters and moulded motifs, some have stained glass in the upper sections. At first floor the timber wall posts, hammer beams and arched braces on stone corbels are visible in the modern classrooms. A floor inserted at the impost level of the roof vault has created a large prayer hall in the roof space where the impressive original hammer-beam roof is visible. A second prayer hall is accommodated in the former church hall to the rear; a suspended ceiling has been inserted here but window openings and wall posts to the roof structure are visible. The former clergy house is used for utilities. History: The building was constructed in 1883 to designs by T Lewis Banks for the Congregational Church. 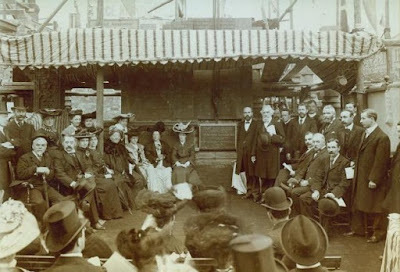 The foundation stone was laid by Henry Wright Esq JP, and the builder was Charles Sharpe. It abutted a church hall, built by the same congregation and architect, dating from 1880 which survives to the rear of the former church. The building became known as the United Reformed Church in the second half of the C20 and in 2002, having become redundant as a church, was granted listed building consent for conversion to a school. The Azhar Academy Girl's School opened in 2003. * an interesting ensemble of buildings, as was common in non-conformist churches, including a slightly earlier church hall of 1880 and a clergy house. Public library, now Newham's registry office. 1898-9 by Silvanus Trevail. Red brick with stone dressings, slate roof with three-stage cupola bearing clock. Two storeys, with gabled attic over entrance bay. Three bays, the outer bays with five-light mullion and transom windows under parapets sporting trefoil headed panels. Central entrance composed like a Diocletian window, pair of blue marble Ionic columns carrying arch, spandrels with bas-reliefs of seated figures with scroll and book. Aprons of first-floor windows inscribed in raised letters 'Passmore Edwards Public Library'. Gabled two-storey returns with windows at first and attic storey. Lower rear section contains reading room (low projecting bay on east side originally contained the ladies' bay). Interior contains a hammer-beam roof to rear reading room. The first and attic storeys originally housed the chief librarian. 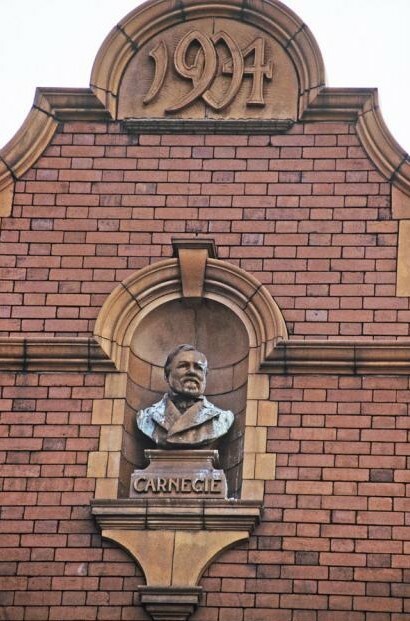 Opened by Herbert Gladstone, MP, 30 November 1899. Largely paid for by John Passmore Edwards, philanthropist and proprietor of the Building News, who promoted libraries in the poorer parts of London. This is an uncommonly richly decorated example of his patronage in a suburban area. Source: Building News, 11 November 1898. We are deeply indebted to English Heritage for their efforts in attempting to preserve key aspects of our architectural history. We acknowledge and are most grateful for their Listed Buildings website (here), from which we have taken most of the material (though not the photos) in this article. We recognise their copyright of the material. So, the ground floor of one of Forest Gate's most recognisable buildings has finally closed as a drinking/eating establishment. 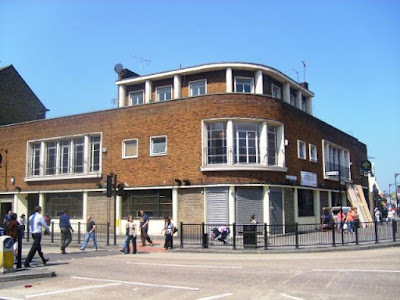 The Princess Alice, and its supping and catering heirs, is no more, as the space is now occupied by the latest national chain-store addition to Woodgrange Road area - Superdrug. Below is the briefest of histories and a photographic trip down memory lane, to mark its passing. It is commonly thought that the pub was named after the Thames pleasure boat of the same name that crashed in the river and sunk, with the loss of 650 lives. 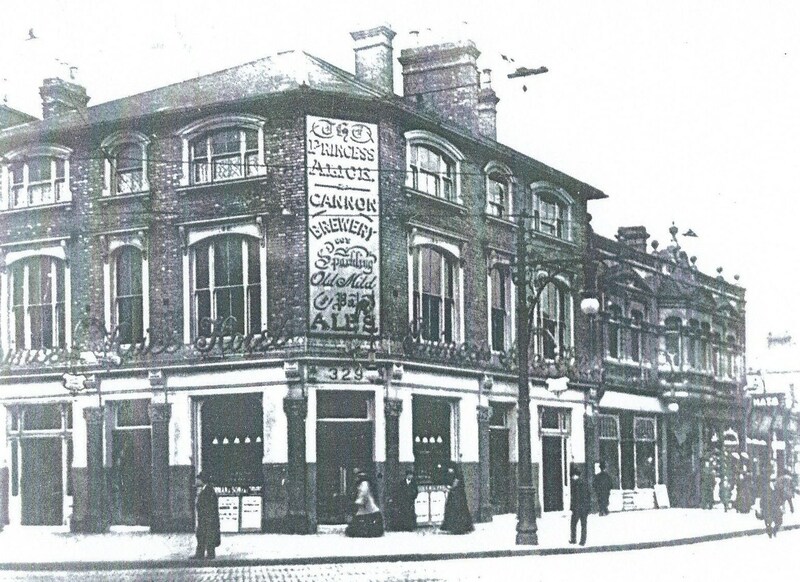 In fact the ship went down in 1878, over a decade after the pub was opened. The pub began business as Forest Gate opened up as a residential area, following the appearance in the district of the early railways. Careful research by Pubshistory.com has traced all the landlords, and those living on the premises, from when it opened in 1868 until the outbreak of World War 11. The first landlord was Charles Bansback, who had been the landlord of the Seven Stars in Brick Lane prior to moving to Forest Gate. He remained until 1874 and was succeeded by a rapid turnover of governors, until 1917, when Percy Thomas Cole took the reins. He held the job for almost the whole inter-war period. We have no details of post WW2 landlords. 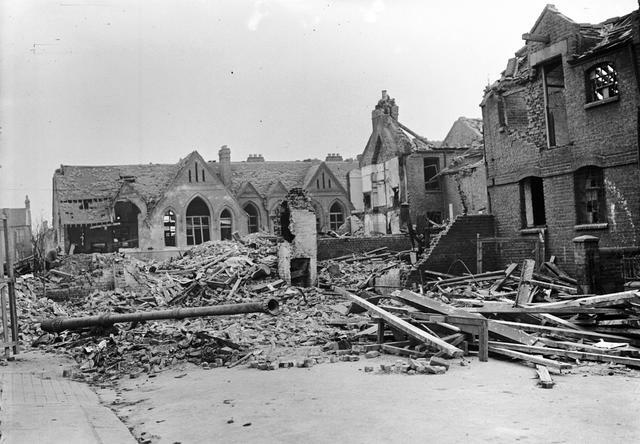 The major event in the pub's 140 year history was the bombing it suffered on 19 April 1941. As the photo below indicates it was totally destroyed. Surprisingly, only one man, out walking his dog, was killed by the blast. The Alice was rebuilt after World War 11, with some vaguely Art Deco features, and an overall appearance not dissimilar to that of the bow of an ocean-going liner - perhaps a mistaken reference to the ill-fated Princess Alice pleasure boat, referred to above. The pub had its ups and downs in the post-war era, but, offering nothing special by way of attraction, it almost inevitably fell to the fierce competition from the Wetherspoon's Hudson Bay, barely a hundred yards away, when it opened. 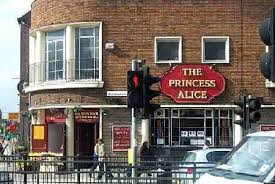 The Alice finally closed, as a pub in 2007. Since that time it's had a number of make-overs and name changes as bars, buffet restaurants and banqueting suites, without ever really seeming busy. It finally gave up the catering ghost, at least on the ground floor, when its latest transformation saw it established as a Superdrug store. Banqueting has been banished to the upstairs. Well Princess Alice remains the official name of the bus stop outside the premises, and it doesn't seem to be a changing to "Superdrug, Forest Gate" any time soon. Should it do so, it would be interesting to see whether it began to carry a rather different selection of curious passengers. Who was the Princess Alice after whom it was named? 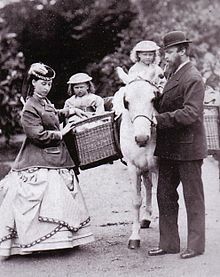 There have been a number of Princess Alices attached to the British royal family, over the centuries. 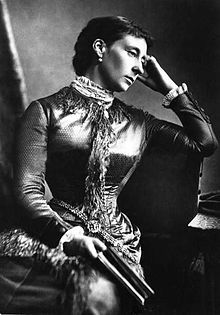 The one whom the pub was named after, however, was Princess Alice of the United Kingdom (1843 - 1878), the third child and second daughter of Queen Victoria. She was the first of Victoria's children to have died. She married Prince Louis of Hesse and was the mother of the last Tsaritsa of Russia (Alexandra). She was also to become the grandmother of Lord Louis Mountbatten, great-great grandmother to Prince Phillip and g x 3 grandmother to Charles etc. 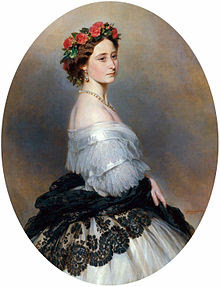 Of more significance, perhaps, she was a prolific patron of women's causes - an uncharacteristically progressive position for a member of a mid nineteenth century European royal family to take. She shared an interest in nursing, particularly the work of Florence Nightingale and of field hospitals in European wars (inevitably fought in the names of members of her family). By co-incidence, May Orchard, nanny to her children, is buried locally in Manor Park cemetery. See here for details. Last week we traced the history of what we now know as our neighbouring district of Manor Park, from the 11th century Domesday book until the latter part of the nineteenth century. We pick up the story here with, the purchase of a seven acre plot of land surrounding the West Ham Manor House, by the Catholic church in 1866. We are indebted to the research undertaken by Shea Lolin for much of what follows in St Nicholas' Industrial School and Chapel, and to the excellent website www.childrenshomes.org.uk - see footnote for details. Much more detail can be obtained from the informative booklet and website, which offers the facility for finding out details of records of children who grew up there. The Catholic church, in the 1860's began to establish Industrial Schools - residential schools for poor, destitute children - to help provide vocational training (in a variety of trades), shored up by their religious faith. An early example was opened in Shernhall Street, in Walthamstow in 1862. 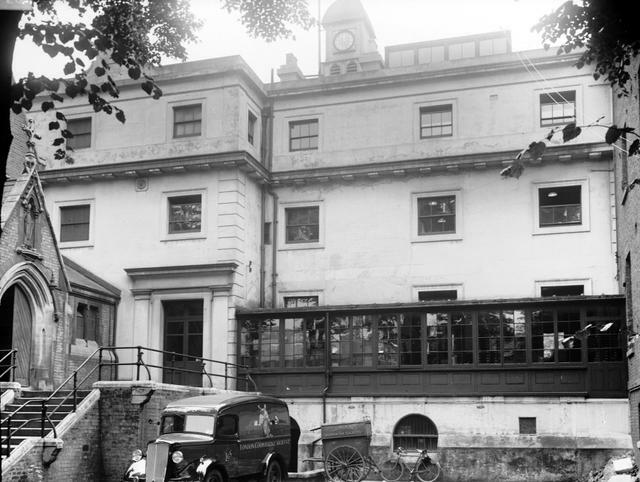 These premises were soon found to be too small, so the church bought seven acres of Little Ilford land in 1866, including the old Manor House, as a site for an expanded presence, in north-east London. The school lasted until the 1920's. It was enclosed by a wall, which still stands, around Whitta Road, and has provoked the curiosity of many a visitor to the near adjacent Golden Fleece pub. The house, itself was used for offices and staff accommodation, and other buildings were constructed for dormitories and teaching rooms. The school was registered with the government in 1868 to teach 250 boys. 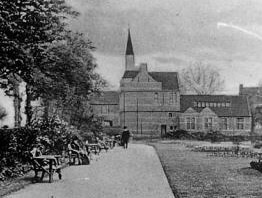 Immediate extensions to the building included a new chapel (which survives today, as the small St Nicholas' church, on Gladding Road), refectory and large workshops. Houses in Sheringham, Hampton and Romford Roads as well as in Islington, were used for additional residential/dormitory accommodation for the boys. Monsignor Searle, who lived in the small house, built as the establishment's lodge, was placed in charge of the institution. The other original staff comprised two schoolmasters, six industrial teachers, a housekeeper, nurse and general servant. The industrial training included carpentry, shoemaking, knitting and gardening. An inspection report in 1875 expressed concern about the high mortality rate of boys at the school, with twelve having died the previous year. It was suggested that sickly constitutions often found among the younger boys would benefit from better diet and clothing, and separate wards under supervision. A year later things had improved with the death rate down to six. In August 1876, Monsignor Searle retired and the management of the house was placed in the hands of the Brothers of Mercy. There are very few schools in the country which more thoroughly provide for the necessities of life than this ... The health of the children is carefully watched and protected. ... No deaths in 1889. The report as to conduct was satisfactory. No insubordination or gross breach of order. Some cases of theft, laziness, disorder, wilful damage, quarrelling, and impertenance. One serious case of stealing keys: a small record of offences for so large a school. Boys well in hand and managed with much tact, special experience and wisdom. Industrial training: receives very careful attention. The new workshops answer their purpose well and are very much more healthy than the old ones. 39 boys work with the tailors; 47 in the shoemaking; good work was being turned out, 45 in the mat-making department., 21 in the field and garden. A class of juniors knit and darn the socks, and three work in the bakery. There is an excellent laundry and the boys assist in the washing. There is a large and well-cultivated garden, which receives much attention and employs a class of boys. General remarks - The display of industrial products on this occasion was highly creditable. From every department good specimens had been sent. Much good work is turned out. Staff: Director, Brother Polycarpo and eight brothers of the Order of Mercy, yard and drill-master, Mr Eade - tailor, shoemaker, mat-maker, gardener, cook and baker. Results on cases discharges in the three years: 1886, 1887 and 1888 - of 123 discharged in 1886-8, there were doing well 107, dead, 2, doubtful 1, convicted of crime or re-committed 10, unknown 3. The Brothers of Mercy resigned their charge of the school on 23 October 1899, when Mr and Mrs Westall took up their duties as superintendent and matron. The school established several auxiliary homes, which provided a half-way house for boys making the transition between institutional care and adult working life. These were located at: 55 Colebrook Row, Islington (open 1894-1900 for 40 boys); Woodgrange House, 607 Romford Road (open 1906-08 for 24 boys. 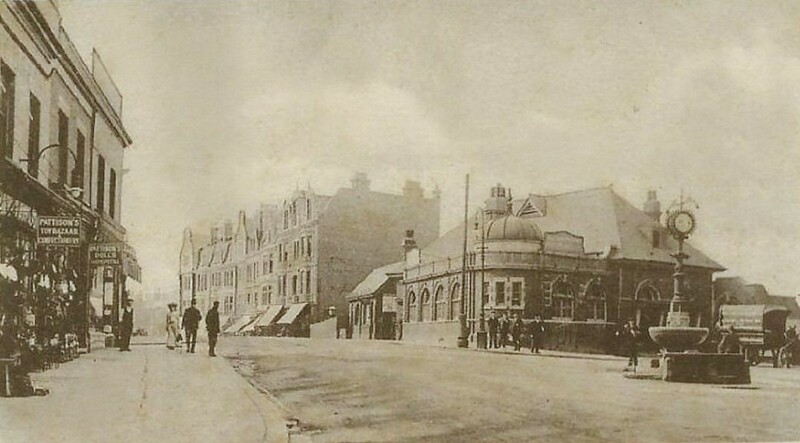 The house has been demolished and the site is now occupied by flats, opposite the Tescos, next to Woodgrange Park station) and 164-166 Sheringham Avenue (opened 1908, for 12 boys - see photo, below). A fire broke out on the school's roof on 6 January 1907. The schoolroom was gutted and the roof burned. The only casualty was one of the firemen, who was badly injured by a burning beam. As well as taking destitute and abandoned Catholic children, the school also took in boys, aged between 7 and 14, who had been convicted by magistrates courts for a variety of offences mainly related to poverty: begging, vagrancy, homelessness and street life. Few of these Industrial Schools achieved high standards, and were often seen simply as repositories for unwanted and forgotten children. St Nicholas' seems to have been an exception, with a good reputation, and saw only a 4% "re-offending" rate amongst its residents - suggesting a good track record for giving their charges a decent restart in life, in its 54 years of existence. An estimated 24,000 boys went through the school in its time, including around 900, who in one of the most controversial aspects of late nineteenth/early twentieth century child care provision, were sent to Canada. This was usually without reference to their parents. They were sent in order to start a new life in Hintonburg, Ontario, as farmers and service personnel. A useful website giving details of British children forceably removed to Canada can be found here. 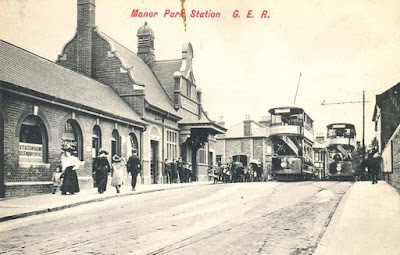 So, Manor Park, as it was now known, developed rapidly from the 1830's, as a result of the construction of some major social projects: a prison, two cemeteries and the Industrial School, together with much low cost housing for rent by potential commuters. Although much of the land in the area had been purchased by the Eastern Counties Railway for their construction of their London - Romford line, the Little Ilford area, itself, was not directly served by the company, at first. Local residents had to trek the mile or so to Forest Gate or East Ham stations, to get commuter transport into the city. They lobbied the railway company to rectify matters, so it built its first station in the area in 1872 and named it Manor Park and Little Ilford, after the house they had formerly owned and the local area. It cost £1,117 to construct. 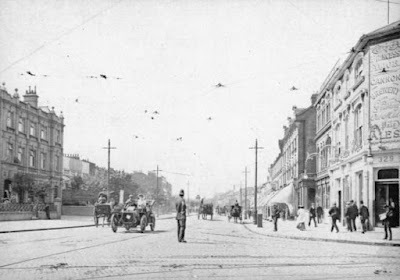 It was later replaced it with a larger station in 1893 (see 1909 photo, below), and had its name shortened simply to Manor Park. With the growth of population in the late 19th century came a demand for local public services and schools. In 1886 Little Ilford merged with East Ham a for local government purposes and subsequently formed part of the East Ham Urban District, which in turn became a Municipal Borough, County Borough and is now part of the London Borough of Newham. The Little Ilford School Board was established in 1887 and built three elementary schools, before merging with the East Ham School Board in 1900. These were: Fourth Avenue School, in 1890 (bombed during World War 11 - see photograph, below), Essex Road School, in 1898 (subsequently, completely rebuilt), and Manor Park Board School in 1893, which later had its name changed to Salisbury School (see photo), which still survives. During the last ten years the parish of East Ham has almost entirely lost its rural character; while a few years ago it was still looked upon as a village of market gardens for the production of cabbages and onions, it is fast becoming a manufacturing, residential town. ... Nowhere, perhaps is this rapid growth more noticeable than in ... Manor Park, a rising locality situated to the north of Ilford (now Romford) Road, with a station on the Great Eastern railway. The wide area of the arable lands, over which the plough passed not so many years ago, has gradually been converted into streets of crowded dwellings, almost entirely inhabited by artisans and the humble city clerks, who are attracted by the low rents of the houses. At the start of the twentieth century the district was badly hit by floods, in 1903, when the River Roding burst its banks, and many people were left homeless. 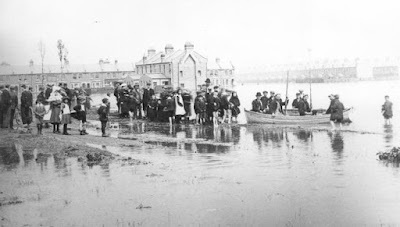 Conditions were so bad that boats had to be hired to rescue the stranded, in the area now occupied by Grantham, Alverstone and Waltham Roads (see photo, below). A year later Manor Park became the proud possessor of an Andrew Carnegie endowed library (see photo of opening ceremony and bust celebrating its benefactor - below). That splendid building served the community as a library for almost 110 years and has recently reopened as a community arts centre. To return to the fate of the Industrial School. World War 1 had an impact on the school, children were moved elsewhere, and in the early 1920s many of these schools became uneconomical to run. The premises and land were put up for sale, and eventually purchased by the London Co-operative Society, which paid £19,000 for the whole seven-acre site, minus the church. The Co-op used the buildings - including the former Manor House - as an administrative centre and its "Industrial Colony". This turned out mainly to be its dairy, which ultimately was capable of producing 1,000 gallons of milk an hour. It also developed workshops for carpenters, joiners, wheelwrights, upholsterers, boot repairers and an educational department. At its peak it employed over 600 people. The premises, after decades of heavy usage began to fall into decay in the early 1970's, and the Co-op wished to redevelop the site. 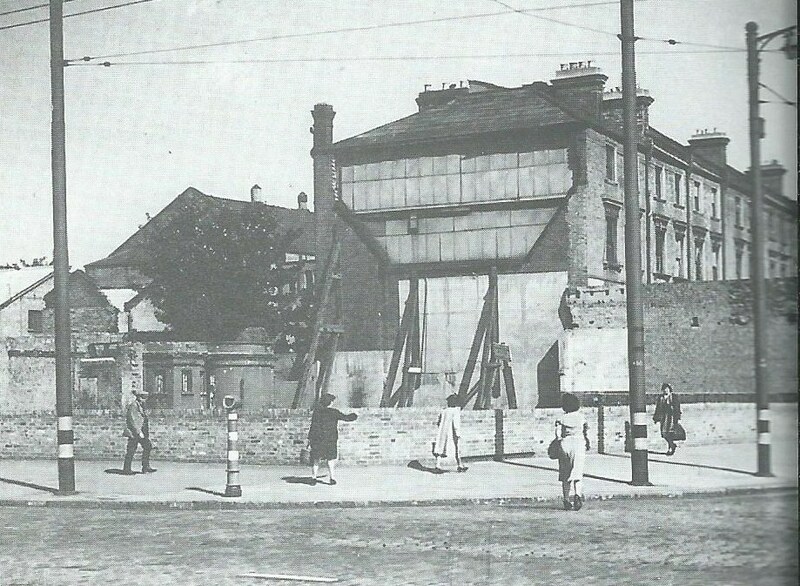 A sticking point was the fate of the Manor House, which was gradually falling into disrepair. The Council, as a condition for planning approval for the redevelopment of the site in the 1980's, wished to have the now-Grade11 listed Manor House restored. This would have cost £12,000, which the Co-op refused to consider, so they gradually began to withdraw from the site. Substantial house 1810-27, probably with earlier origins. Stucco rendering slates. Two storeys and attic. Five sash windows in architrave surrounds. Central doorway with console bricketed cornice. Rusticated end pilasters. Cornice above first floor windows across front missing. Square headed sash windows retaining glazing bars. Hipped slate roof. Central C 19 timber clock and bell turret with squared dome (clock missing). Interior has some old features. The house was eventually sold to an Irish property developer, and survives today, as 10 flats (see a recent photo, below). BUPA Care Homes bought most of the rest of the grounds and employ around 120 staff, catering for the 120 residents in the four units they have built on the site. The Co-op still has a presence on part of the lands, from where they run their Funeral Care service, servicing many of the local cemeteries. Footnote: St Nicholas' Industrial School and Chapel by Shea Lolin Dec 2010 Available from bookshops and Amazon for £6.00.